Get a closer look at that mixer section. The signal arrives from the filter at the top, into the rectangular black blob with a shiny top. That's a 6dB attenuator, which will improve the return loss ratio (RLR) for the match the mixer structure presents to the filter output by 12dB. This is at the expense of the noise figure by 6dB. The SMA connection at lower right is the +12dBm local oscillator input, which will get up to 3.5GHz. 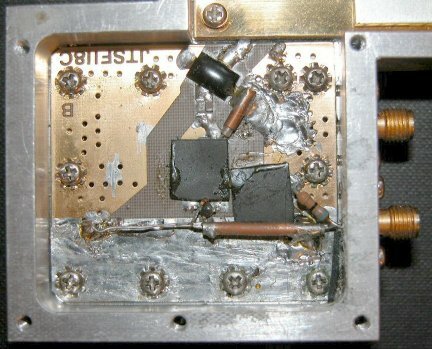 The other connector is the intermediate frequency (IF) output which is just over 2GHz. Oh Wow! This one has been somewhat "modified". There is a short open circuit stub made from a piece of RG405 coaxial hardline hanging from one side of the balun structure, and more of that black plastic stuff. The 68 ohms resistor is clearly most of the LO input termination, although a wire ended type like that would not have been my choice. The whole lower end looks like it has been a "experimental area"
What have they done? !! It gets worse! The black plastics are stuck down with some kind of goo that makes green corrosion in various places where the gold has tinned, and it has eaten through one bent back leg of the 4-terminal ring mixer diode component. I'm more than a little upset now. Even if I don't understand what I am doing, and end up breaking it, I just have to get those plastics off. Page 4 - Spectrum Analyser Mixer Dissection - Oh Yes - it is still full of surprises!